Construction is complete on the first batch of 81 new satellites to overhaul Iridium’s mobile communications network, and the data relay stations will soon head from their factory near Phoenix to California’s hilly Central Coast for launch in September on a SpaceX Falcon 9 rocket. The satellites will be shipped in pairs on a truck to Vandenberg Air Force Base, where they will be fueled and mated with the Falcon 9 launcher for liftoff at 10:33 p.m. PDT on Sept. 11 (0533 GMT; 1:33 a.m. EDT on Sept. 12) from Space Launch Complex 4-East. The flight will mark the third Falcon 9 launch from Vandenberg, and the first launch from there of an upgraded “full-thrust” version of the booster with higher-power Merlin engines and super-chilled propellants. SpaceX is finishing up modifications to the launch pad this summer to support the latest Falcon 9 configuration. Launching 10 at a time, each Iridium satellite weighs about 1,896 pounds (860 kilograms). The satellites, combined with their specially-designed dispenser developed by SpaceX, will among the heaviest payloads ever launched by a Falcon 9 rocket. Iridium declared the first two of its next-generation mobile communications satellites complete last month, with plans to finish assembly of one more spacecraft per week through late 2017. The Iridium Next program is a $3 billion investment by Iridium, according to Matt Desch, Iridium’s chief executive officer. Iridium’s purchase of 81 satellites represents approximately $2.2 billion of that cost, Desch said, and the company’s launch contract with SpaceX for seven Falcon 9 flights was valued at $492 million when the parties signed it in 2010. 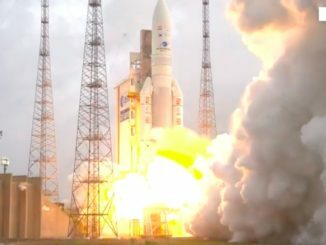 That was the largest commercial launch contract in history until last year’s 21-launch order by satellite Internet provider OneWeb with Arianespace. The first 10 Iridium Next satellites will fly on a Falcon 9 rocket in September, followed by a second launch as soon as December with the next batch. Iridium managers will give the go-ahead for the second launch once the first 10 satellites finish initial in-orbit tests, Desch said. The other five launches should occur about once every two months next year to fill out the Iridium Next fleet 485 miles (780 kilometers) above Earth. Iridium’s contract with SpaceX calls for all the missions to fly on newly-built Falcon 9s, a situation unlikely to change any time soon since insurance arrangements for the initial launches have been finalized. “It’s going to be a very, very busy 18 months as many, many things have to happen literally hour-by-hour and day-by-day to make that happen, but I’m very confident and increasingly pleased with the progress made,” Desch said last month during a media tour of the Iridium Next satellite factory in Gilbert, Arizona. Iridium hoped to have the first 10 satellites in orbit by July, but Desch said the Air Force-operated range at Vandenberg was unavailable until September. The Air Force said renovations of facilities for the Joint Space Operations Center and the Joint Functional Component Command for Space at Vandenberg will take the West Coast launch site offline through August. The relocation of range systems from one building to another has kept launches grounded at Vandenberg since March. The move will free up room to consolidate military commanders with personnel charged with tracking thousands of objects in space, the orbital traffic cops who catalog new satellites and space junk to help prevent dangerous collisions. “There’s a big backlog of commercial and government customers they’re trying to get off, and they’re trying to fit all that in and do the best they can with it,” Desch said. Other launches waiting for the Air Force’s Western Range to re-open include a United Launch Alliance Atlas 5 flight with the commercial WorldView 4 Earth observatory set for Sept. 15, and an Orbital ATK Minotaur-C rocket launch in October with six Earth-viewing satellites for Google’s Terra Bella subsidiary. 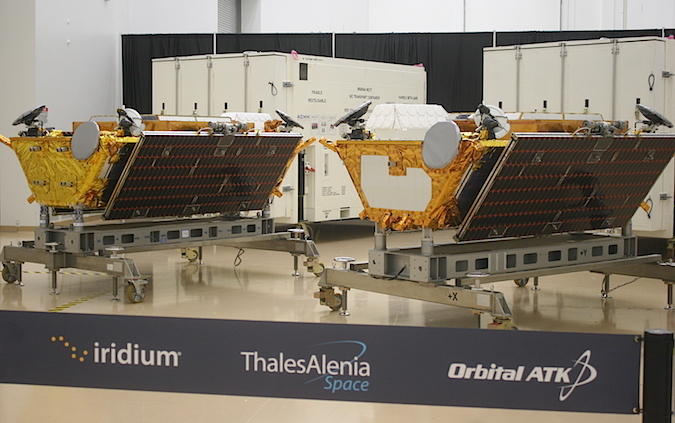 The first two Iridium Next satellites off the assembly line, numbered No. 1 and No. 3, were originally supposed to launch from Russia on a Dnepr rocket, a modified Soviet-era ballistic missile marketed for commercial launches by Kosmotras, a Russian-Ukrainian joint venture. But with relations soured between those countries, the future of the Dnepr program is in doubt, and the Russian government has reportedly ordered a halt to future Dnepr launches. Iridium shuffled its launch schedule to begin launching the next-generation spacecraft on the Falcon 9, disrupting plans to initially place two pathfinder satellites in orbit for testing. Desch said he is confident SpaceX will be ready to deploy the first 10 Iridium Next satellites in September. The company has a busy Falcon 9 launch manifest, with missions due at a rate of more than once per month, but the Iridium flight is the next SpaceX launch from Vandenberg. “We’re really on a separate queue out at Vandenberg, so we really are the priority for SpaceX out there, and they’ll get us off as soon as Vandenberg lets us go,” Desch said. SpaceX officials said earlier this year that technicians are updating ground facilities at the Vandenberg launch site for the latest version of the Falcon 9, which stands about five feet taller and burns colder propellants. Iridium selected Thales Alenia Space as prime contractor for the company’s 81 Iridium Next satellites. Orbital ATK manages assembly and launch preparations for the spacecraft. Bertrand Maureau, vice president of telecommunications at Thales Alenia Space, offered figures to quantify the complexity and scale of building so many satellites. 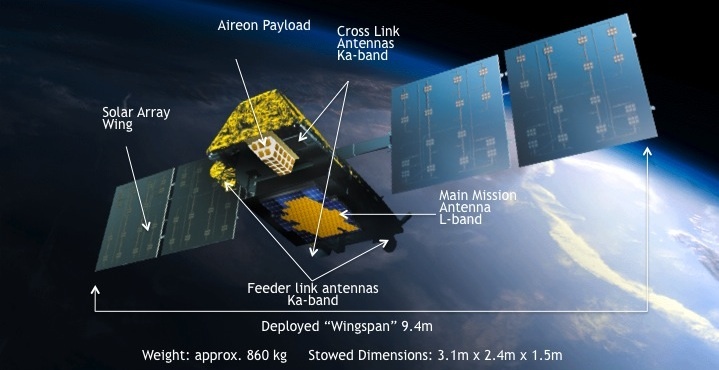 The communications payloads on the 81 satellites required the production of 14,000 transmit-receive modules, devices which link the orbiting platforms with each other via cross-links and feed signals to ground stations, Maureau said. Developers wrote approximately 500,000 lines of software code for the Iridium Next project, he said. 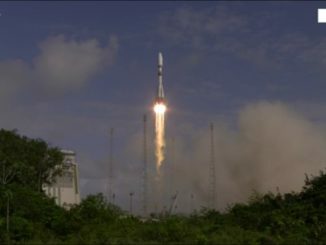 “This is a real-time, fully-processed payload, which means that every message between all the satellites, the ground, gateways and the users — all satellites of the constellation, one satellite to another — are managed in real time thanks to state-of-the-art hardware and software components,” Maureau said. Each satellite has its own digital switchboard. The Iridium Next satellites will replace the company’s aging space fleet, most of which launched before 2000. “These satellites have even greater functionality and faster broadband speeds,” Desch said. 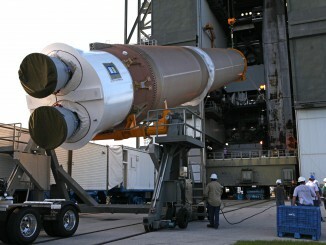 For example, 3G cellular services will be supported by the Iridium next fleet. Enough Iridium Next satellites should be launched by the end of 2017 to fully replace the first-generation fleet, allowing controllers to retire and de-orbit the old spacecraft. Iridium has launch contracts with SpaceX and Kosmotras for 72 satellites, but Desch said the company plans to eventually launch all 81 birds. 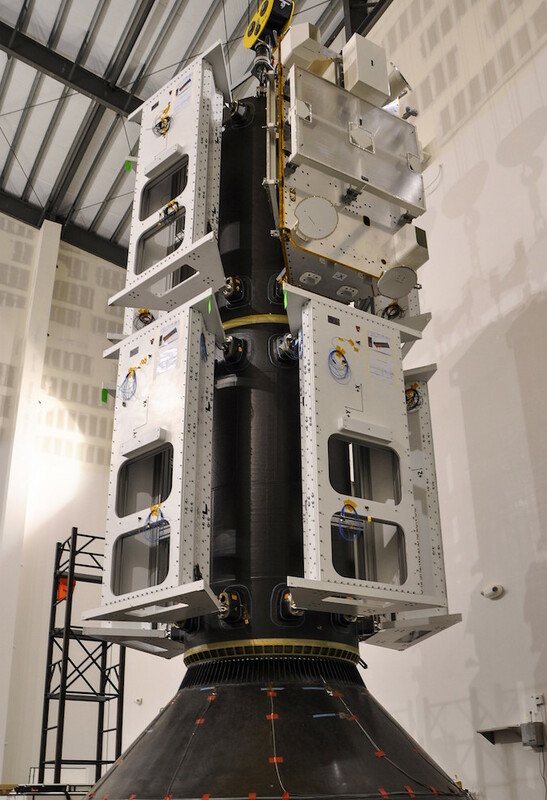 “Thales Alenia designed a new satellite to our specification consisting of something like 5,000 individual parts that Orbital ATK has assembled and tested, and comprising, over the overall program, something like 100,000 hours of workmanship by hundreds of engineers,” Desch said. Iridium and Orbital ATK showed off the Gilbert, Arizona, factory for Iridium Next to reporters last month. Nearly 20 satellites were in various stages of assembly on a production floor with multiple stations, where engineers add components like antennas, solar arrays and reaction wheels, then test each spacecraft’s resiliency to the wild temperature swings of low Earth orbit. It takes between 40 and 50 days to assemble one satellite in the Arizona factory specially built for the Iridium Next program, officials said. At that rate, five satellites should roll off the assembly line every month. The new satellites benefit two decades of lessons learned since the original fleet deployed in the 1990s, and an Iridium test site a few miles from the Orbital ATK satellite plant near Phoenix is already demonstrating the performance of the Iridium Next satellites. A stand-in spacecraft housed in a high-tech laboratory there is routing thousands of mock phone calls while engineers track its performance. “This time around, with all that experience we’ve gained over the last 25 years in this program, we’ve got a much more powerful satellite, and we are really ready to go right now with some very sophisticated and powerful satellites,” Desch said. A defect inside the satellites’ Ka-band transmit-receive modules discovered last year delayed the first Iridium Next launch four months. The problem caused Iridium to miss its long-projected 2015 launch date for the first new-generation satellites, but the delay allowed engineers to finish software validations, and the spacecraft will now launch with all features verified, officials said. Iridium officials said the satellites are each designed to last at least 15 years, and with proper sparing, the Iridium Next constellation could last into the mid-2030s.